Welcome to JEG Calls. I've been duck hunting for over 25 years now, even during those "no-ducks" 80's. I started turning almost 10 years ago to make myself and my brothers custom duck calls and I still find them possibly the most enjoyable thing I do. I hand make my calls from any kind of wood that is suitable for doing so. Prices on commissioned work start from $45.00 for a duck call to $110.00 for a goose flute and I do take work on commission so if your interested in a particular wood combination or call on this page let me know. Check back here once in awhile and I may be offering one for sale directly from this page. I also sell them on EBAY so click here (EBAY) to go to my EBAY page and see if I am offering any this week. 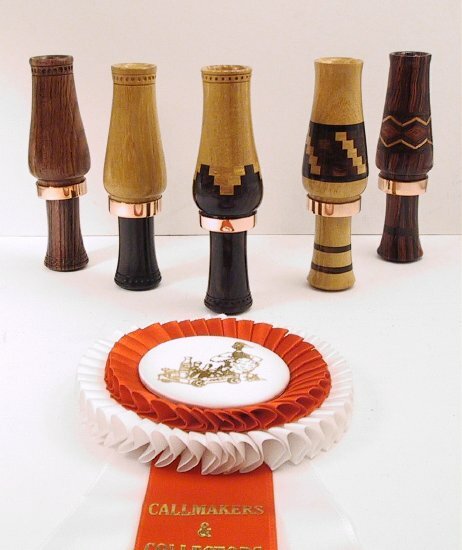 The duck calls are double reed, with O-ring seals, and the goose calls are Canada goose calls that are single reed with O-ring seals. I brand my initials in the tone chamber and number and date each one as well. Feel free to e-mail me with any questions or requests you have. Thanks for looking and good hunting.. 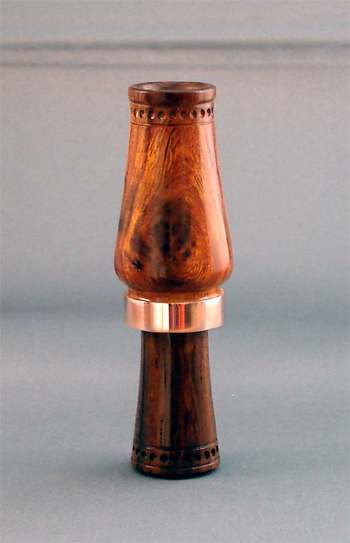 This is a beautiful call made from desert ironwood and east indian rosewood. Desert Ironwood is becoming more rare and carries a hefty price for a piece like this thus the higher price on this one. The camera really cant capture the beauty of this one. 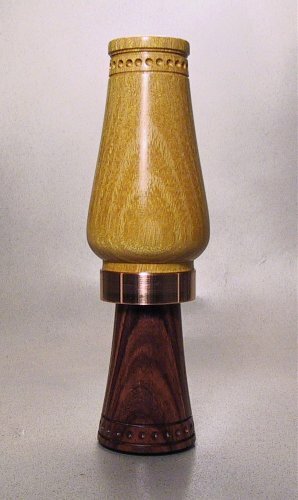 $75.00 plus $5.00 S & H.
This is a nice common call made from Osage Orange and East Indian Rosewood. Nice pics of some of the calls I have made. The call in the middle took second place in the CCA laminated novice division.